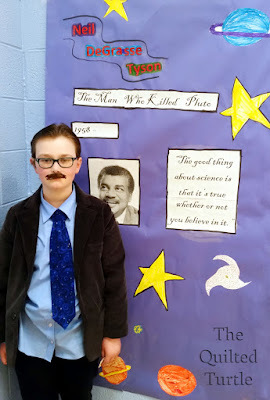 The Wax Museum was another fun activity the kids got to do for March is Reading Month. Back at the end of February each of them choose a "Space Case" (a.k.a. an important person relating to space science) to research and then become for the Wax Museum. 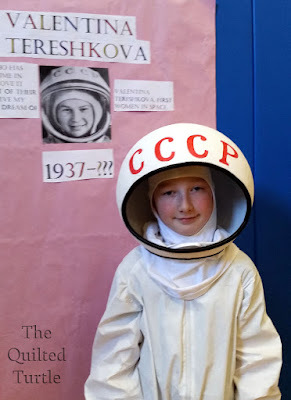 My son wanted to learn more about Valentina Tereshkova, the first woman in space. (In 1963 - the Soviet Union did it a full 20 years before the US sent Sally Ride up on the space shuttle Challenger.) He and I worked for over a week making his paper mache helmet, while grandma only took an afternoon to cut down a size 2X Tyvek suit so it would fit him. He loved learning that the Russian space agency sent her into space for three days without a toothbrush. Wonderful learning projects. You should definitely send him a photo! I love these costumes. You do great work as a family! I sent a link to this post to Neil deGrasse Tyson on Twitter. Maybe he will check it out. I love the costumes. You do great work as a family! I sent a link to this post to Neil deGrasse Tyson on Twitter. Maybe he will check it out.